Boulder, Colorado landscaping plant of the month, February 2015 – SKYROCKET JUNIPERS – Glacier View Landscape and Design, Inc. In many of today’s smaller subdivisions privacy is a big issue. One of the great ways Glacier View Landscape achieves privacy in small backyards, especially in Boulder, Colorado landscapes, is with the use of upright Junipers. 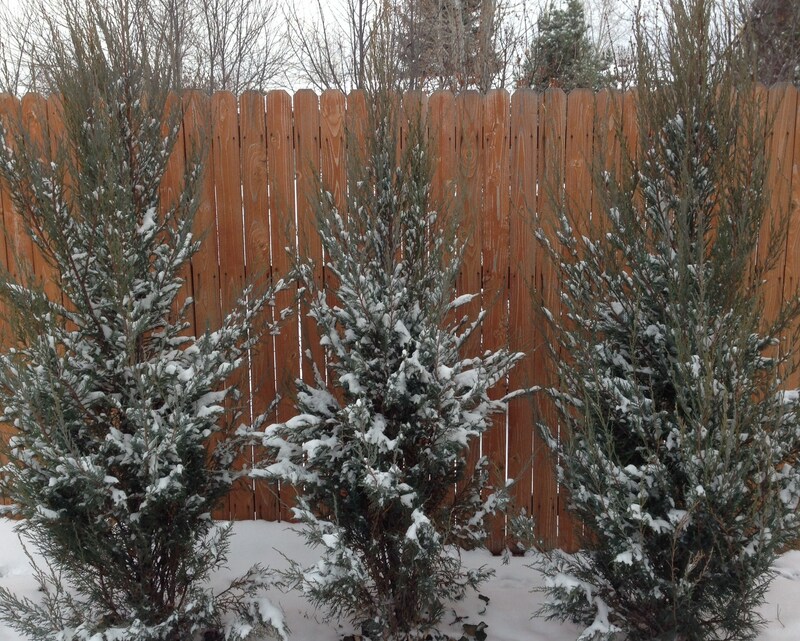 Some upright junipers are too wide to be feasible in small backyards, such as the standard Rocky Mountain Juniper. Therefore we like to use Skyrocket Juniper because of their narrow width but tall height. Skyrocket Juniper only get 2 to 3 feet wide near the base and can tower as high as 20 feet in the right conditions. If planted in a row along a fence, for instance, privacy can be achieved year round without sacrificing valuable lawn space. There are several options to columnar type evergreens for screening but the Skyrocket Juniper is the most cost-effective because of their initial price, the size at which they can be attained for initial planting…sometimes up to 9’ tall, and their rapid growth rate. Skyrocket Juniper can grow 18 inches to 24 inches in one year once established in the right growing conditions. Often, the skyrocket juniper is used as an effective windbreak as well. Planted on the north or north west sides of properties here along the Colorado Front Range, the Skyrocket Juniper can protect from the strong Chinook winds in December, January, and February, as well as from the north and north east winds common during upslope snowstorms. Finally skyrocket juniper can be used as an anchor plant for the corner of the home or for the corner of the backyard in place of the standard larger Colorado Blue Spruce or some other wider and larger evergreen which might be out of place in a smaller yard. Another benefit of the Junipers, in general, is their drought tolerance. Once established, they need minimal watering in order to maintain their beauty and continued growth. Skyrocket has an attractive bluish to blue-green color throughout the year except in winter when it may develop a bit of orange or bronze color as the plants attempt to go dormant in the coldest parts of the season. A lot of Glacier View Landscape customers, myself included, have real desirability problems with most spreading Junipers, and all Junipers in general. Essentially, they and I don’t like them. But, they really have gotten a bad rap over the last 50 years or so, as people associate Junipers with the unkempt, overgrown 1950’s ranch homeowner who has not trimmed the Junipers planted in front of their home….ever…hiding the house from view! A home buried in Junipers is not attractive. But sometimes an upright Juniper is the appropriate choice both for cost-effectiveness and applicability to the smaller landscapes in Boulder, Colorado. Find the spot, and plant one or three to try them out!